The courses of the strata, or the length and breadth of surface occupied by each, as they rise successively from the level of the sea, on the eastern to the western side of the Island, are represented by colours. The edges of the strata, which may all be crossed in journey from east to west, are called their outcrops; and the under-edge of every stratum, being the top of the next, and that being generally the best defined, is represented by the fullest part of each colour…. 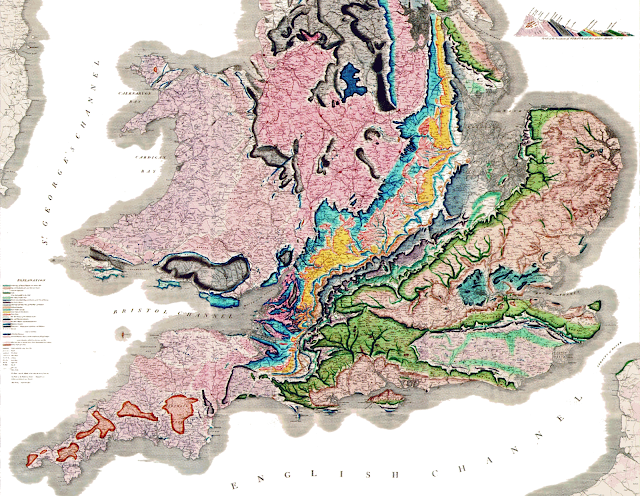 The colours, though brighter than those they represent, are in some degree assimulated to the colour of each stratum, except the chalk, which being colourless seems best represented by green, as strong colours are necessary, and there being no stratum of equal extent which required that colour....In this mode of representing the strata by colours, various insular, or detached parts of the same colour may be observed.